Asma al-Mohattwari-almotamar.net - “Children buy their Eid clothes happily, while I am outside the shopping mall waiting for them to allow me to clean their cars so I can get some money to eat,” said 12-year-old Salim. On one of al-Hodeida’s streets, exactly in front a shopping mall, stands Salim. With great sadness in his eyes, Salim looks to the children who were shopping with their parents for Eid clothes. He wishes he could enter the mall; just to be near to the nice clothes, to touch them but not to buy or wear them. “I never imagined that I could wear such clothes. I just want to enter the mall,” Salim said with a smile on his face, a smile that conceals pain. Salim was at the mall not only to daydream about clothes; he was there for much more important reason. He was waiting for the shoppers to exit so he could clean their cars. He was working because he needs money, not to buy clothes, but to buy food for him and his family. Six years ago, Salim was studying in first grade at school in his village, but stopped when his father decided to move to the city of Hodeida in search of prosperity. They left Kadden, their village, and moved to Hodeida, but discovered that they didn’t have the resources to find a home. The only option for Salim and his family was to live in a tent. His father, two sisters and brother made a tent their home; soon looking to the street for work. Unfortunately, the family’s new beginning was devastated as Salim’s mother was killed in al-Malahidh village, Haradh during the Sada’a war. Life was so dark in the eyes of Salim: he felt lonely, poor and dejected. He had nothing but street work with his father. In the early morning, Salim went to Sana’a Street in Hodeida to sell tissues. He continued his job under the blazing sun until 2:00 pm, after which he goes home with some food. 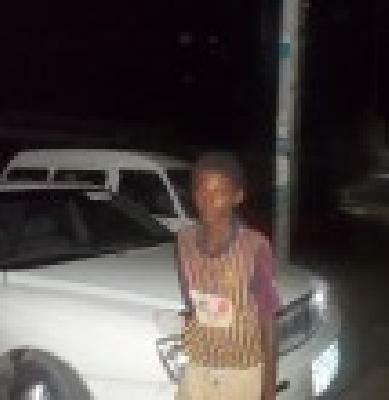 At 4:00 pm he goes to the streets again, but this time not to sell tissues but to clean cars until 10:00 pm. He does the same thing everyday until all he thinks about is work. “I wish I could go to school, but I know it is impossible for we don’t have money for studying,” he said sadly. “My dream was to be a policeman and arrest those who killed my mother but I know I can be only a worker on the street,” remarked Salim. Despite the progress of the last 15 years made in education a lot of Yemeni children still suffer a life similar to Salim’s. Reports issued by UNICEF say that in the past decade registration to schools has improved for both males and females, however, more than one million children are still outside schools: especially females. The report noted that 30% of students not enrolled in schools are girls while 14% are boys. A study issued by the Rehabilitation of Working Children Centre reported 80% of boys and 20% of girls who are not enrolled in schools are working in the street. The study showed that 40% of children working in the streets sell newspapers, food, water, snacks, and tissues or clean cars. Though it is recognized that Yemeni Law No. 45 of 2002 on Children’s Rights requires the state to take necessary measures to aid children suffering from difficult living circumstances, many children are exposed to abuse, exploited or lured into performing illegal acts. Despite this law, the number of street children continues to increase for many reasons:The level of the family poverty, lack of schools and compulsory education, lack of knowledge of child labor laws, racism, wars and crises that create an economic burden, the prevailing educational system and the lack of international programs to fight poverty. According to a study prepared by the Supreme Council for Motherhood and Childhood, familial poverty is the main reason for child labor, where the whole is family forced to work to secure their living. Ms. Huda Yahiya, a teacher, noted that to solve the child labor problem the Ministry of Education should make education free, including registration, uniforms, books, stationery and school supplies, also they should make education obligatory. Hodeida is considered one of the poorest provinces in Yemen; a province where the phenomenon of child labor is growing due to unmitigated poverty. In the markets, on the streets, and in alleyways of Hodeida there are children who hold out bottles of water, cartons of tissue, and gum working day and night. Dr. Hanan Ali, a psychologist, said that regardless of education, child labor affects a child’s psychology badly, causes them different mental maladies like introversion and depression. “Yemen can’t be developed if we don’t take a serious step towards providing these children with education, as education is the main investment for development,” she said. Salim and Ibrahim are just two examples of thousands of children who suffer everyday in Yemen. To fix these problems and free our street children, organizations, governments, businessmen and Yemenis in general should align for the future of Yemen’s children and the future of Yemen.